I have found that one of the best and most memorable ways kids learn is simply through playing. Make it fun and they remember it more clearly and with more passion than any boring lesson. This is always in the back of my mind as both a mom and as a teacher. Everything I do stems from this basic little fact and it inspires me to keep things fun, active and memorable for my Lil Divas. The Lil Divas love jumping on our pillows, couches and well just about anywhere. Don't let my nickname for them fool you! They might be Divas but they love active, rough & tumble play. 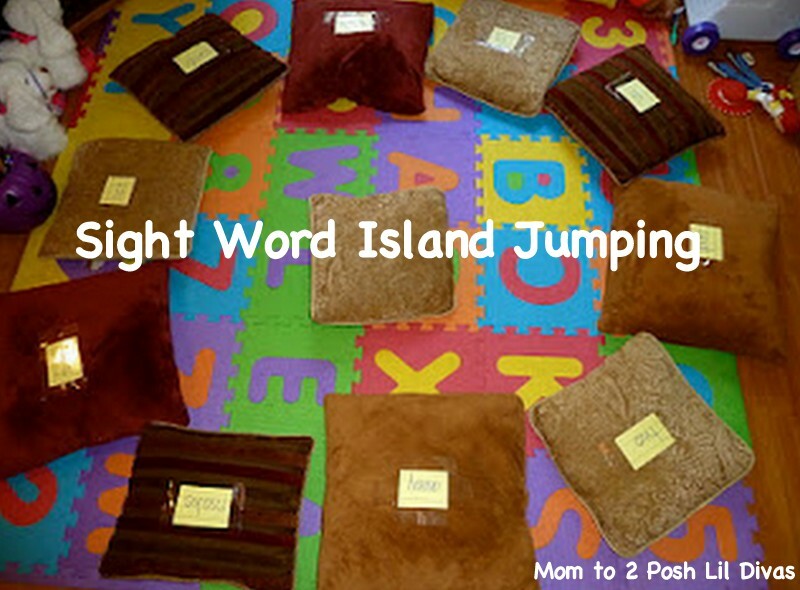 Inspired by our latest monster read - Where the Wild Things Are and the 30 Day Play Challenge from Hands:On We Grow and The Imagination Tree I took all the pillows we had on our couches and created Sight Word Islands for some hopping & learning fun. They are on their safe island but beware - all around them are wild beasts ready to roar, snap, gnash & claw! I would call out a word and the Lil Divas had to jump to the correct island/word. Lots of fun, playing, jumping and imagination. Plus, they were learning too! A fabulous way to play to learn! How fun!! I would love it if you would share it at my Sharing Saturday Party at http://craftymomsshare.blogspot.com/2011/11/sharing-saturday-4.html. Thank you! I love the use of sight words in this game, very clever! Its so interesting to see what all the mums do with the different play challenges. Great idea to help learn those sight words! Shared on fb. Thanks for the post. What an awesome idea! I am going to do this with my son this week! Except we will jump to the letters he is learning. Thank you for the reminder to keep the fun in homeschool. Sometimes we get wrapped up in the busyness of homeschool and life and I forget to use games in teaching. Great sight word game, DS would love it. Looks like you had LOTS of fun! A great way to set up the activity! This looks awesome. I love adding the big motor units to help activate that kinestethic component. Thanks for sharing such an easy to prepare idea. What a great idea! This would be fun for a rainy day activity when the kids have way too much energy for inside. I love that you could adapt the idea to review so many concepts in addition to sight words. This looks like great fun! JDaniel would love hopping from word to word. Love this, Bern. Pinned it for my first grader for sight words and my preschooler for letters and numbers. My kids are constantly flinging the pillows off the couch and jumping around on them. Might as well sneak some learning in. Thanks! Thank you so much for this fantastic idea. My 6 year old is active beyond belief and the idea of having her "sit down" to learn anything concerns me, because it would be a challenge for both her and I. I am certain that she is destined to learn this way. I can't wait to get started.